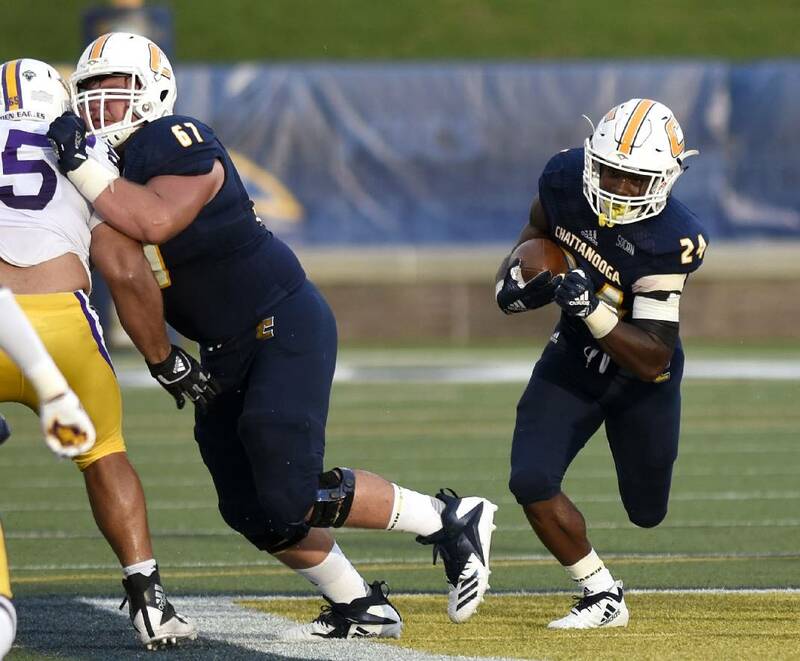 Alex Trotter carries the football behind the block of Noah Ramsey during UTC's season-opening win against Tennessee Tech last week at Finley Stadium. The Mocs made improving their offensive line and running game an offseason priority enter Tom Arth's second year as head coach. The University of Tennessee at Chattanooga enjoyed one of its most successful rushing performances of second-year football coach Tom Arth's tenure in a season-opening win over Tennessee Tech at Finley Stadium last week. The opponent who endured the Mocs' top rushing performance in the Arth era will host the Mocs this week. The Mocs averaged 4.6 yards per carry in their 34-10 win in the opener, second only to the 7.5 yards they averaged on 19 carries in last season's 20-14 loss to The Citadel. The games mark the only two times UTC has topped more than 4 yards per rush in 12 games under Arth's leadership. Last week marked a solid start to a new season, and now the Mocs will try to take that ground momentum with them to Saturday's 6 p.m. game against The Citadel in Charleston, South Carolina. "Our offense is built on establishing the run first," offensive coordinator Justin Rascati said. "We want to do that every week. We played better up front last week and it showed. Both of our running backs (junior Tyrell Price and senior Alex Trotter) are tough to tackle, and they do a good job. "We want to find ways to run it every week. We want to dominate the line of scrimmage and find ways to get the ball to our playmakers. That's our identity — to feed the studs — and it's my job to prepare those guys every week and get them touches." Although the Mocs want to establish the run first, there are exceptions. Last week, the Golden Eagles took away the run early, which opened up screen passes on the outside for big gains. That included a 30-yard completion to Tyrell Price that set up a field goal in the first quarter, and a back-breaking 89-yard touchdown from Nick Tiano to Bryce Nunnelly in the second quarter, a play aided by tight end Jordan Giberti's downfield blocking. Tiano passed for 220 yards in the first half. In the second half, the Mocs rushed for 113 yards on 21 carries, capped by a 40-yard touchdown run by Price, who had 82 of his 98 rushing yards in the second half. "You've got to run the ball effectively," junior offensive lineman Harrison Moon said. "As an offensive lineman, you take pride in getting that push and moving another man. If we open up the run game, the pass game will naturally open up, so we have to run the ball effectively." The Mocs made improving the offensive line a priority in the offseason. Moon was one of three transfers who started against Tennessee Tech, along with guard Chris Barnes and center Noah Ramsey. The group has only worked on the field together for a little more than month, but those three and returning left tackle Malcolm White — a three-year starter — and sophomore left guard Cole Strange were able to create some holes for Price, Tiano and Trotter. "They're still growing together as a unit," Arth said. "There really is no other position group that need to work as well together as the offensive line. You have to have five guys on the same page and working in the same direction and communicating. A lot of times that takes time and developing and playing games to get there. "I like where we're at now, we've been pleased, but I know they're only going to improve the more snaps they play together."